We have a bit of a glut of veggies in our fridge at the moment, in particular, carrots. I knew before making supper that I wanted to be able to use up a good portion of them, as well as making something that was healthy and filling. Tom had been talking about wanting steak earlier in the week (I made him have halloumi instead, which as he pointed out, is NOT the same!). He was very pleased to have steak last night and he didn’t even ask where the noodles were! 1. Coarsley grate the courgette, and carrots and put in a large bowl. Cut the pepper and broccoli stalk into matchsticks/finely slice and add to the bowl. 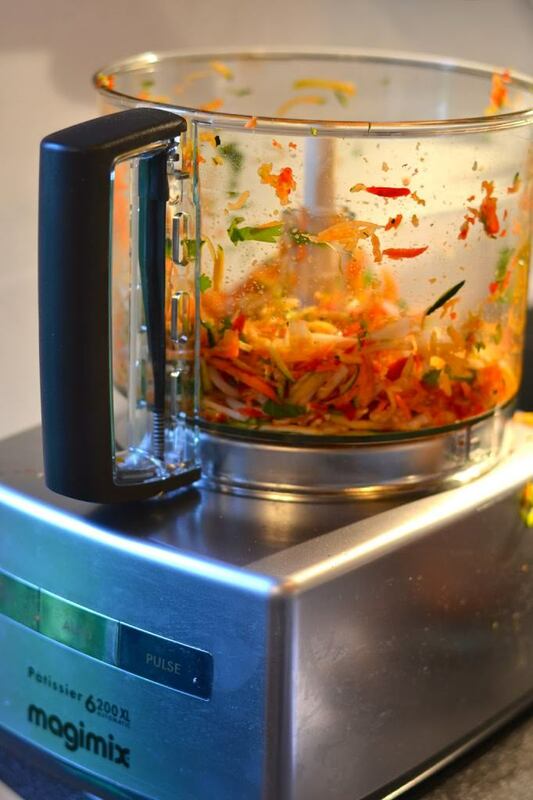 Alternatively, use the grater attachment on a food processor and grate them all. (This is what I did and it saved a lot of time!). 2. 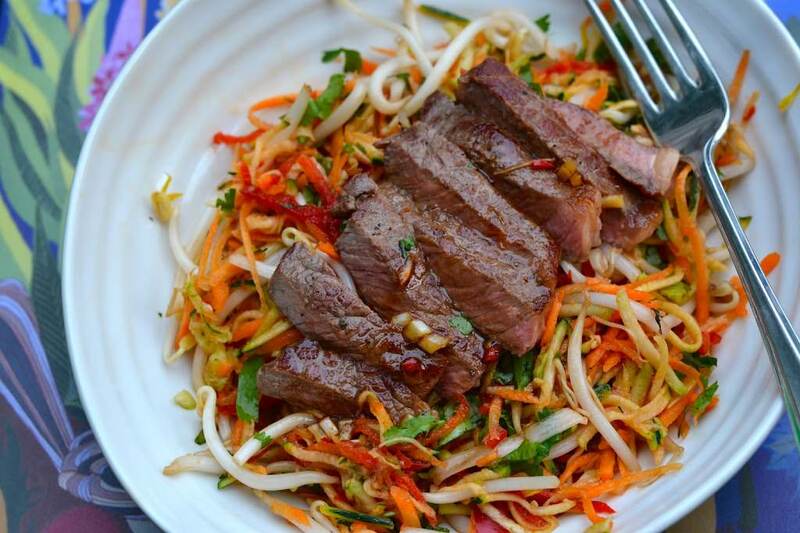 Stir the chili, spring onion, bean sprouts, mint and coriander in to the other veggies. Meanwhile, heat a large non-stick frying pan over high heat, until almost smoking. Season the steaks and brush with oil. Fry steaks for about 3min on each side, until cooked to desired amount- depending on the thickness of your steaks, this should give a medium finish. 3. Let the steaks rest while you make the dressing. In a small jug or jam jar, mix together all of the dressing ingredients, and season to taste. Feel free to change the amounts of agave, lime and soy depending on your tastes! 4. Divide the veggies between two bowls or plates. 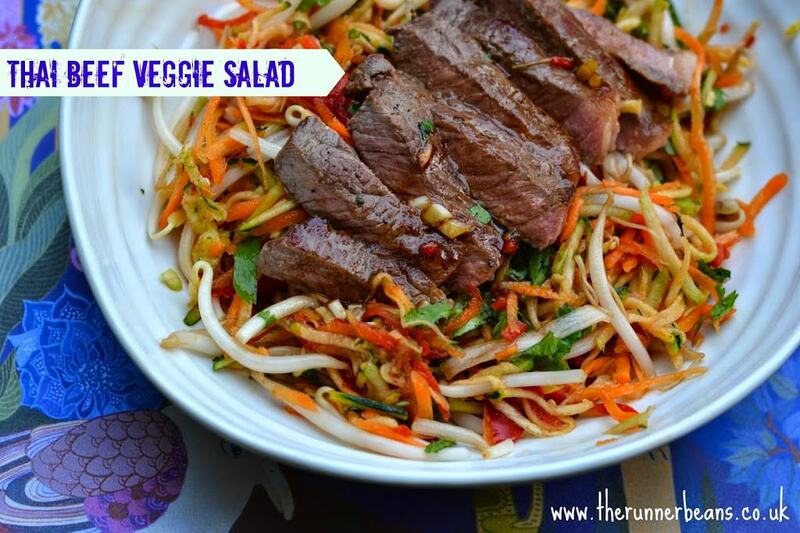 Thinly slice the steaks and lay on top of the veggies; drizzle over the dressing. 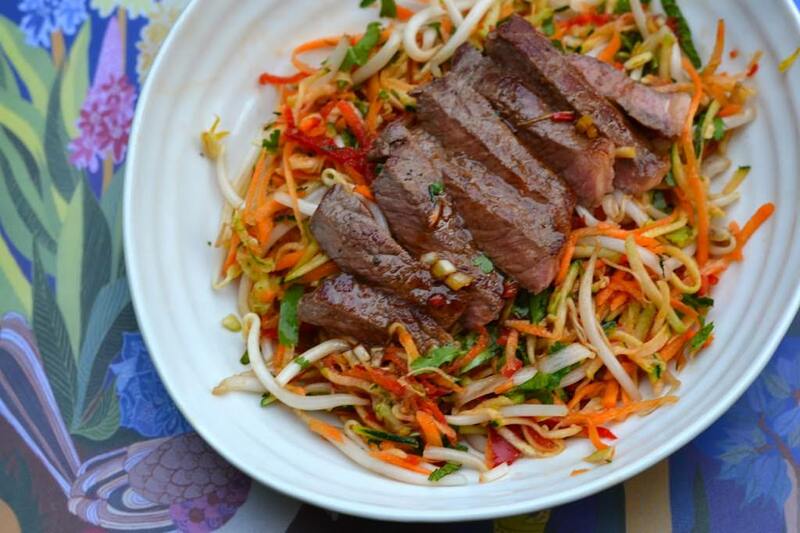 You could make this recipe using pork fillet, prawns or salmon instead of steak if you like.